I don’t know. The final words spoken by The Commander as the screen fades to black and the latest episode in the Guild Wars 2 living story comes to an end. This month’s episode of Living Story pulled off the kind of twist I’d expect to see in a Game of Thrones arc. Those of us who have been following the living story have been adventuring with Aurene for over three years, from the day she hatched to putting her through tests so that she might one day be a blessing on Tyria instead of a burden, through her battles over the course of the Path of Fire expansion story, and now through Season 4 as we’ve exhaustively built her powers and learned that Aurene was Glint’s second scion, destined to destroy Kralkatorrik with the help of her champion (us) and take her rightful place as a powerful elder dragon. And in this episode we successfully made it through Glint’s trials, forged the new dragonblood weapons, and finally executed the plan to kill Kralkatorrik once and for all. In one swift motion, everything that we worked for was destroyed. And as the commander comes forward to view her mangled body and our friends mourn the loss of their friend and only hope for stopping the end of the world, Braham wonders what we could possibly do now. And our commander, the single person that they depend on to lead the crew and know just the right way to solve any dilemma is forced to admit: “I don’t know.” Maybe it is all hopeless. The writing team for the Guild Wars 2 Living Story deserves an award for this quarter’s episode in how masterfully it built up our expectations only to shoot them right in the heart. Talk about playing the long game. I went into this episode of two minds, the first being that there was no way they could possibly kill Kralkatorrik when this is definitely not the season finale. The other half reminded me that I didn’t think they would kill Palawa Joko as early as episode three, and yet they did it anyway. I’m going to go straight into the denial stage and say that I’m not entirely convinced that Aurene is gone for good. This is Guild Wars 2, after all, a world where necromancers exist, the afterlife is occasionally a suggestion more than a demand, and people and beings have come back from the dead. Aurene did eat the lich king after all, perhaps some of his powers of resurrection transferred over to her? Another thing to think about is the Domain of the Lost. We know that Kralkatorrik was tearing it apart before our big battle, I don’t think it would have been so specifically discussed if it wasn’t important. Since Aurene died how she did, it’s likely we will find her in the Domain, and we know from past experience that it is possible to escape and return to the living world. We did it, Balthazar did it, Joko did it, in fact there doesn’t seem to be a whole lot of protection to make sure that the dead actually stay dead in this world. There are a lot of questions to be answered going into episode 6. What did Aurene see when she went through the portal and spoke to Glint? What effect will Aurene’s connection with Caithe bring? Can we get back into the Domain of the Lost to retrieve Aurene? Was everything that happened part of Glint’s plan? It looked like Aurene managed to brand Kralkatorrik during the fight, what effect will that have? Why did Kralkatorrik just leave when the fight was virtually won, and he could have destroyed the Commander and the remaining forces right then and there? I can say that if Aurene is dead for good, the world just got a whole lot more bleak. Our weapon against an increasingly rampaging Kralkatorrik is gone and we have no ideas on what to do next. 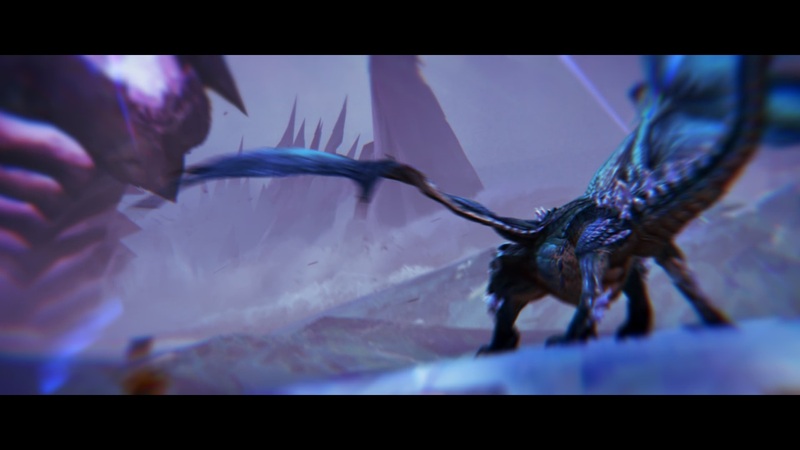 Unfortunately we really needed a dragon to replace Kralkatorrik, because in the world of Guild Wars 2 killing an elder dragon without at least an intern to replace them will just cause an imbalance and destroy the world anyway. We’ll find out next time on Season 4 Episode 6: The Search for Aurene (Not the actual title). In the meantime, I’m going to go back to chopping these onions. It’s the onions, I swear! Another thought about the episode, I really enjoyed the fact that Arenanet avoided going down the standard route of having the story peppered with several fights against small health sponges leading up to the big long fight against the large health sponge. They should do this more for future episodes, in my humbled opinion.